At the start of spring, Japan transforms into a pink floral wonderland. From the end of March to mid-April, cherry blossoms, or sakura, bloom across the Land of the Rising Sun, symbolizing renewal, vitality and beauty. The sakura bloom begins at the southernmost tip of Japan and works its way north, each bloom lasting for a maximum of about 2 weeks. Because of this fleeting beauty, cherry blossom season is associated with the Buddhist concept of mono no aware which expresses the impermanence of things and an acceptance that even life’s most beautiful moments can’t last forever. To celebrate cherry blossom season is to deepen your appreciation for life by living in the moment and feeling grateful for the beauty life offers. A common practice during sakura season is Hanami—the tradition of viewing and enjoying the beauty of the sakura. The first practice of Hanami began during the Nara period, about 1,300 years ago. In the period to follow, the Heian period, Buddhist influence was at its peak and Hanami became a common practice mainly reserved for the Imperial Court. Hanami's peaceful beauty and meditative nature soon found its way as a custom for the samurai society, then eventually reaching the common Japanese people. Soon, drinking sake and having a nice lunch under the sakura trees became popular, marking the beginning of this great tradition. 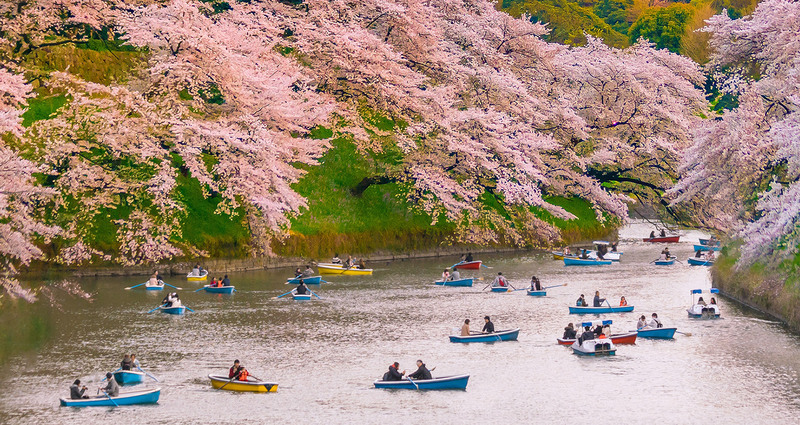 Today, thousands of people from across the globe flock to Japan to witness the iconic beauty of sakura. A modern Hanami celebration might include a picnic under a sakura tree well into the night, when the moon illuminates the sakura's beautiful pink color. Office workers will often take their lunches under a sakura tree every day while the season lasts—though the high demand to do so often means sending out a co-worker to reserve a spot! The popularity of Hanami has only increased over time as the joyful celebrations under a sakura tree continue to remind people of the beauty and gift of life.